Rock 'n Roll Show 2019. TICKETS NOW ON SALE. Click here for full details. 2019 ‘That’ll Be The Day’ Summer Rock ‘n Roll Show of the 50’s 60’s and 70’s. 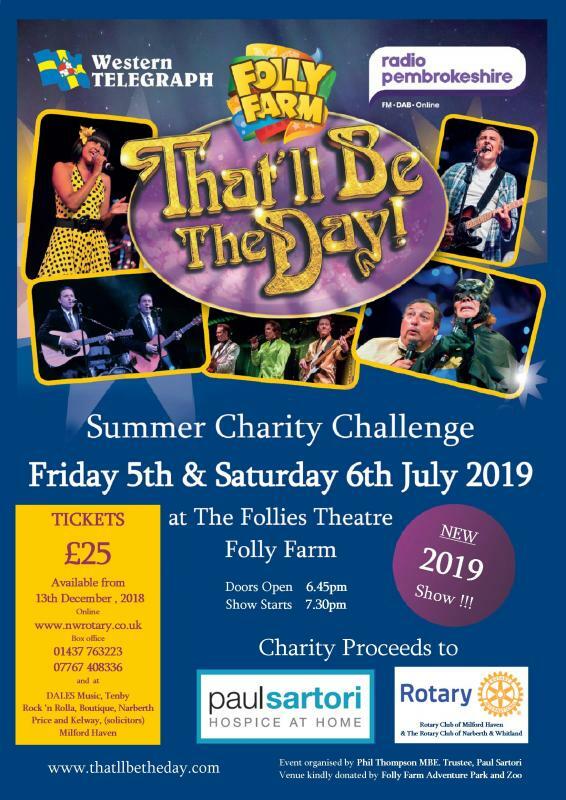 Phil Thompson MBE, the organiser of the ‘That’ll Be The Day’ Rock ‘n Roll Show of The 50’s 60’s and 70’s has nominated 3 Charities namely, The Paul Sartori Foundation. The Rotary Club of Milford Haven and The Rotary Club of Narberth & Whitland to be the beneficiaries of this year’s event. Telephone purchases can be made from The Paul Sartori Foundation 01437 763223. ( No booking fee but £1 per order to cover P & P). Cash Purchases for tickets from Dales Music Shop, Tenby; The Creative Café, Haverfordwest; Rock ‘n Rolla Boutique, Narberth; Price & Kelway, Solicitors, Milford Haven or from any member of Milford Haven or Narberth & Whitland Rotary Club.